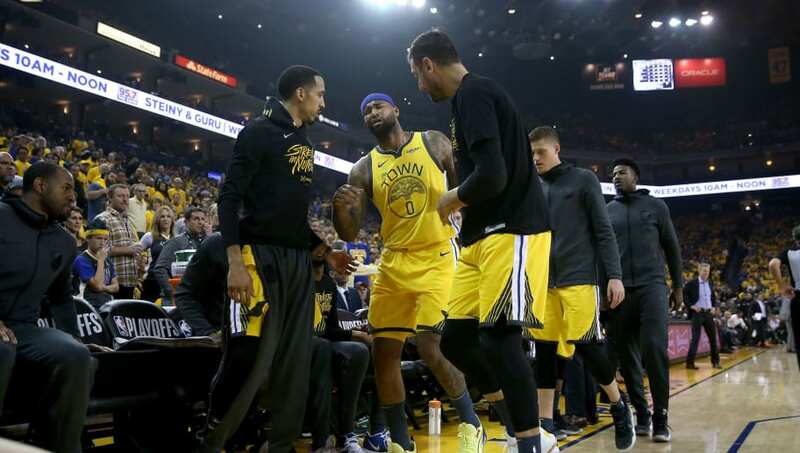 ​​DeMarcus Cousins has had some rough injury luck of late, and it's not getting any better as he's in search of his first ring with the ​Golden State Warriors. Boogie left Game 2 of the Dubs first-round series against the Los Angeles Clippers with a quad injury, and upon further review, it doesn't look great. Cousins will officially have an MRI on Tuesday, but if this close-up is any indication, we ought to be prepared for (at least) moderately bad news. That's...not how this is supposed to go. While we all initially hoped Cousins' ailment was only a cramp as he headed off the floor to the locker room, he did not return to Game 2 and could miss further time, pending the status of the aforementioned MRI. Cousins signed a one-year 'prove it' deal with the Warriors this past offseason, hoping to come back healthier than ever and ball out on the game's greatest stage. Instead, he suffers what could be another setback.